The Fed is faced with a problem that is best represented by the first two charts below. 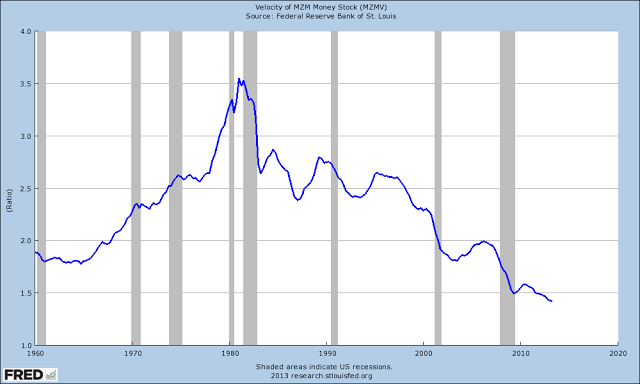 Velocity of money is a simple ratio measure of money supply and GNP. It intends to represent the number of times a unit of money is exchanged in a transaction over a period of time. 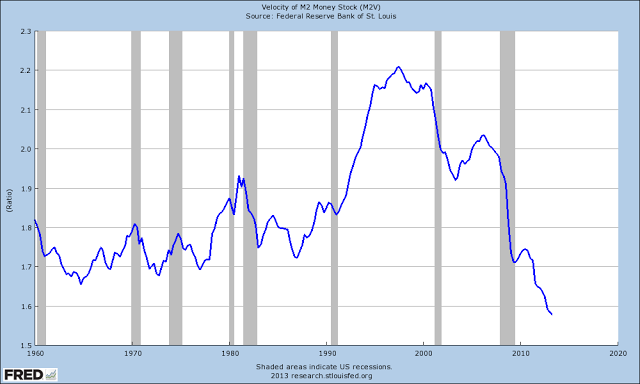 As you can see, the velocity of the two broad money supply measures is dropping to historic lows. Is this because the great mass of people are ‘hoarding money,’ which implies that one should lower real interest on savings, even taking them more deeply into the negative through monetary inflation in order to encourage spending through fear of de facto confiscation? The third chart gives some insight into the true nature of the economic problem. Most of the income gains this century and for the past two or three decades of the past have been flowing to the top few percent of US households. The median household, the middle if you will, has been steadily losing ground in large part to Fed and political policy decisions driven by a mistaken ideology and a top down or trickle down approach to prosperity. If the Fed pursues monetary inflation, without taking strong steps, even through the use of its bully pulpit and actions as regulator, to correct the severe policy imbalances that lopsidedly favor the wealthy financiers, it will drive the US middle class over an economic cliff and destroy the very system which it is attempting to save. That is the basis of the tragic policy error of the Fed and the ruling class. 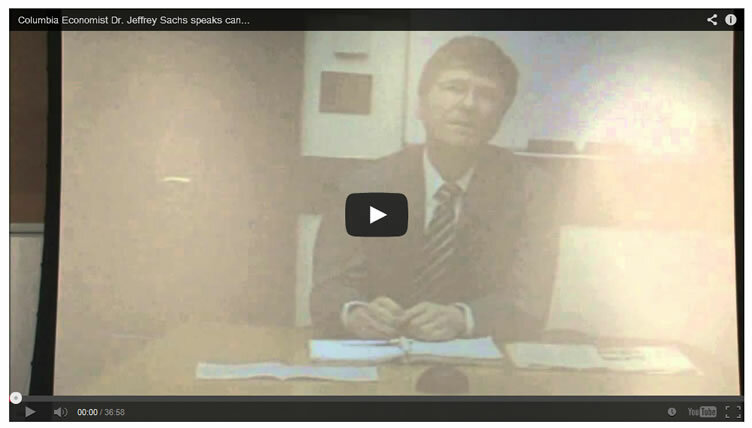 Jeffrey Sachs has noted it in a recent talk to the Philly Fed shown below, and Bill Black has some particularly scathing words today for the ‘Hyper-meritocracy Led by Criminal Morons.’ I might have said self-delusional narcissists or even sociopaths rather than morons. The majority of those who enable the abuse of power are merely careerists. One can make the strong case that the primary responsibility for this is in the political leadership. But one cannot also deny that as policy influencer and regulator the Fed has favored, quite actively, the growth of imbalances and social and economic injustice by pursuing a blind allegiance to a mistaken theory of deregulation and oligopoly of banking capital. An audacious oligarchy needs someone to rescue them from themselves. And this will not be an easy task because the system is corrupted and the powerful have been blinded by greed. The current political deadlock in Washington is a symptom of the problem. There is always an element that believes in a long range plan consisting of repression as required, disinformation, and plundering the weak. The monied class do not ‘create jobs.’ Genuine organic and systemic demand for good and services creates jobs, and those who have the means respond to that demand. It is a virtuous cycle that begins with consumer demand, and the willingness and the ability to pay for it. Yes there may be a role for inorganic demand such as stimulus to ‘kick start’ an economy caught in a policy error trap, but it is the reforms that allow for organic growth that make it sustainable. Moving offshore to find new demand for markets while abandoning one’s domestic base to decline and failure, in the true colonial fashion of past economic empires, is a form of neurotic failure. It often lights a fire in men’s minds, and becomes a sort of self-fulfilling cultural suicide. And perhaps this is embodied in the latest corporatist deal which is the infamously secretive Trans-Pacific Partnership. How fitting that, having overturned most of the financial reforms of the past century, we stand here now on the brink, on the 75th anniversary of the New Deal, with essentially the same set of problems facing us that brought the world down so low in The Great Depression, and opened the door to the madness that followed. If you look at the campaign contributions, which I happened to do yesterday for another purpose, the financial markets are the number one campaign contributors in the U.S. system now. We have a corrupt politics to the core, I’m afraid to say, and no party is – I mean there’s – if not both parties are up to their necks in this. This has nothing to do with Democrats or Republicans. It really doesn’t have anything to do with right wing or left wing, by the way. The corruption is, as far as I can see, everywhere. But what it’s led to is this sense of impunity that is really stunning and you feel it on the individual level right now. And it’s very very unhealthy, I have waited for four years, five years now to see one figure on Wall Street speak in a moral language.